Guido Barbieri was born in Parma in 1956. After graduating from high school he graduated in Philosophy and Pedagogy at the University of Padua. Between 1979 and 1981 he collaborated as theatrical and musical critic to the newspapers La Tribuna di Treviso and Il Mattino di Padova. In 1981 he began his collaboration with RAI music programs. First with Radio Uno (Civiltà dello Spettacolo) and then with Radio Tre (Musical afternoon, Morning concert, A certain speech, Review of magazines, Anthology, Flight notes, Radio Tre Suite). He currently acts as host and correspondent for the Radio Tre Suite program and as a music consultant for the RAI Third Radio Network. For Rai International he has recently edited and presented eight monographic cycles of musical topics broadcast in 35 foreign countries. For Rai Sat Show he realized, on the occasion of Verdi’s celebrations in 2001, the presentation of the complete cycle of Giuseppe Verdi’s works. The entire cycle has been replicated in recent months by Rai5 as part of the celebrations broadcasting the 150th anniversary of the Unification of Italy. In 1985 he began a long relationship of collaboration, as a music critic, with the newspaper Il Messaggero di Roma, a relationship that continued in the mid-nineties with Il Gazzettino di Venezia. He is currently one of the musical critics of the newspaper La Repubblica. In the first half of the eighties he organized exhibitions, conventions and concert events for Cidim, the Italian Music Committee adhering to UNESCO. He then served as a music consultant at the Directorate General for Cultural Relations of the Ministry of Foreign Affairs and participated in the bilateral commissions for the awarding of scholarships awarded to Italian students from the main foreign countries. Intense publicity: he has created hall programs, conferences and translations for some of the major Italian musical institutions: Rai Symphony Orchestra of Rome, Teatro dell’Opera di Roma, Accademia Nazionale di S. Cecilia, Teatro del Maggio Musicale Fiorentino, Teatro La Fenice di Venezia, Teatro Massimo di Palermo, Teatro S. Carlo di Napoli, Teatro Pergolesi di Jesi, etc .., as well as for festivals and music festivals (Sagra Musicale Umbra, Sienese Music Weeks, Panathenae Pompeiane, Festival of Nations, New Consonance, Music Research Center of Rome, etc. ..). He has collaborated and still collaborates with numerous specialized magazines (Music and Dossier, Giornale della Musica, Suono, Amadeus, Piano Time, Applause, Reading, Music System) and he has directed the “Suono Sud” quarterly published by the Institute for almost ten years. the Musical Development of the South. He has made two volumes: a monograph dedicated to Georg Friederich Haendel, published by Newton Compton, and a guide to listening to Mozart’s Le Nozze di Figaro published by the publisher Gremese. In 2010 he published a long essay, entitled “The anesthesia of the heart”, in the collective volume “I portatori del tempo” edited by Achille Bonito Oliva and published by Electa Mondadori. He is currently involved in the drafting of a monograph dedicated to Edgard Varèse which will be published by the Epos publishing house in Palermo. He has written theatrical and radio texts on musical topics (since the greedy thirst dedicated to Carlo Gesualdo, A Lost Voice on Farinelli, The Civilization of Machines on Edgard Varèse, Study Without Light on Andres Segovia, etc.) and texts and librettos for some Italian composers (Ennio Morricone, Michelangelo Lupone, Laura Bianchini, Luigi Ceccarelli, Emanuele Pappalardo). He wrote the text of the musical work Portopalo. Names, on tombs without bodies, staged in December 2006 at the Auditorium of Rome with the music of Riccardo Nova and directed by Giorgio Barberio Corsetti, and Al kamandjati, directed by Moni Ovadia and music by Franghiz Ali Zadeh. In March 2012, the multimedia work “Three Mile Island” will be staged at the ZKM in Karlsruhe, written in collaboration with Andrea Molino. In 2007 he participated in the Prix Italia with the radio opera La corda spezzata. Theater and music in the Inferno of Terezin, played by Toni Servillo, Maria Paiato and Antonio Tidona. He has also collaborated for the production of texts and translations with numerous record companies (Deutsche Grammophon, Rca, Edi Pan, Rai Trade, Stradivarius) and publishing houses (Curci, Studio Tesi, Einaudi, Electa Mondadori). 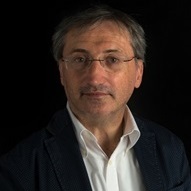 He has written some entries for L’Enciclopedia Treccani published by the Italian Institute for the Encyclopaedia and has produced five of the twenty volumes of the “Grande Storia della Musica Classica” published by the editorial “La Repubblica”. Since 1984 he has taught History of Music and History and Aesthetic Music in Italian Conservatories. After the Conservatories of Reggio Calabria, Salerno, Pescara, L’Aquila and Florence is now a tenured professor at the “Antonio Scontrino” Conservatory of Trapani. In 2006 he was elected an effective member of the Academic Council and of the Scientific Commission of the aforementioned Institute. Currently he is the editorial consultant of the Fondazione Musica per Roma for contemporary music. In July 2005 he received the “Feronia Award” for music criticism. He is artistic director of the “Guido Michelli” Concert Society of Ancona. Since October 2011 he is Artistic Director of the Società Aquilana dei Concerti “B. Barattelli “.